Remember this version of Meringue Sarai made for the Fall Palette Challenge? Some of you noticed that this version had a waistband, while the original pattern from the book is simply faced at the waist. Today, we’ve got a tutorial for you on adding a waistband to a skirt like the Meringue. Start with the Meringue skirt pattern. 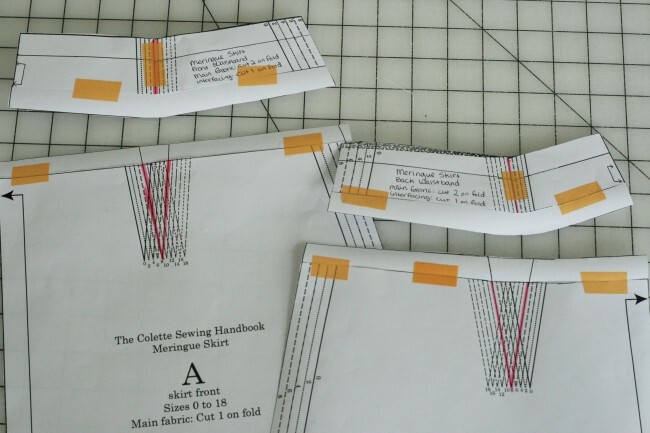 Since you will be making a waistband, you can set aside the waist facing pieces as they won’t be needed. Both front and back pieces will be changed in the same way. For this example we’ll be focusing on the back piece since it will have more of a curve at the waistline. 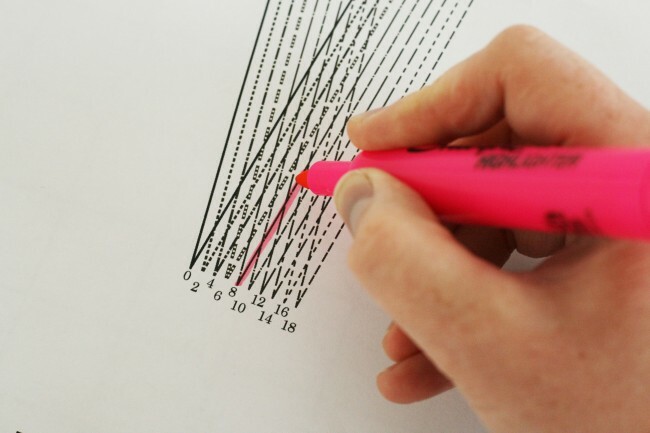 With a highlighter or marker, draw along the dart. 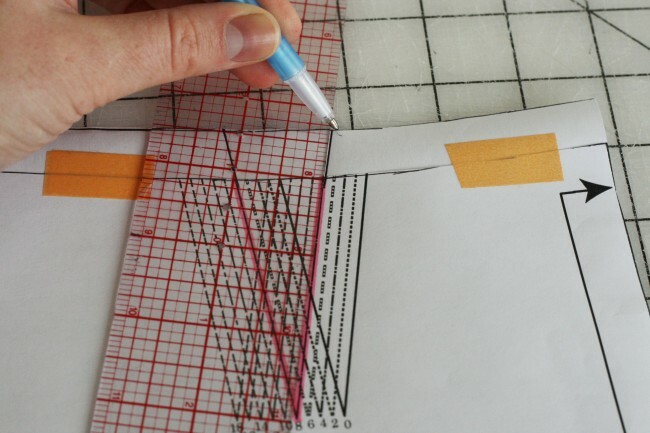 Use a clear ruler to add a seam line to the pattern along the waistline. It will be 5/8″ from the edge of the pattern. 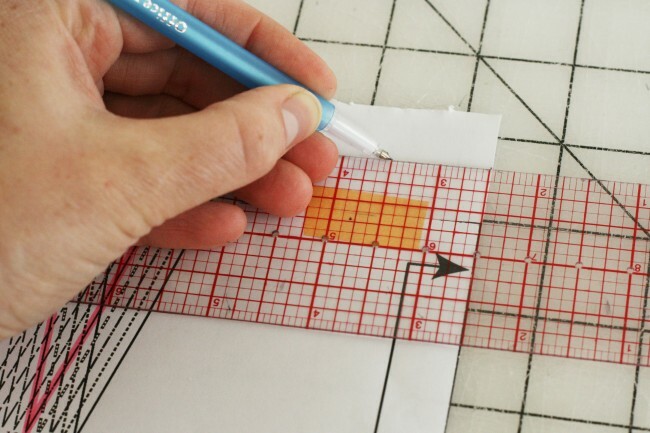 Now draw a line 1″ below the line you just drew. This will be the width of the waistband. 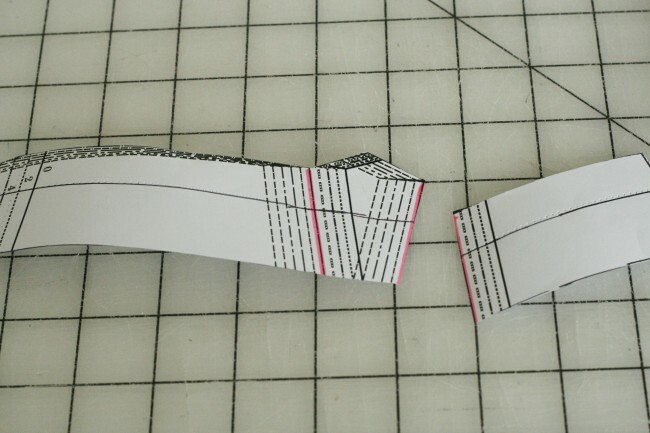 Cut the pattern along the line, separating the piece into two. Tape a piece of paper along the top of the skirt pattern. 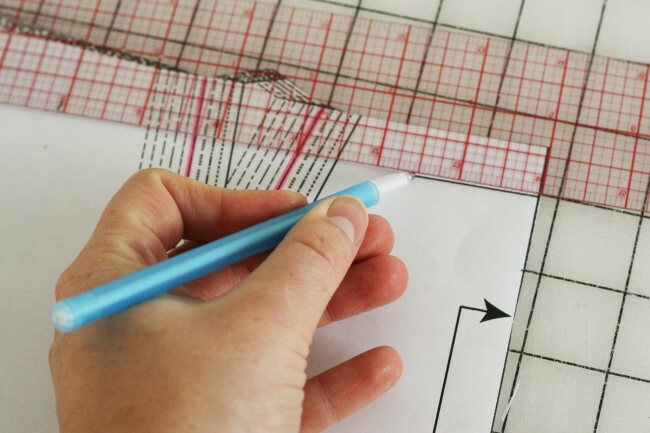 Use a ruler to add a 5/8″ seam allowance to the top of the skirt. 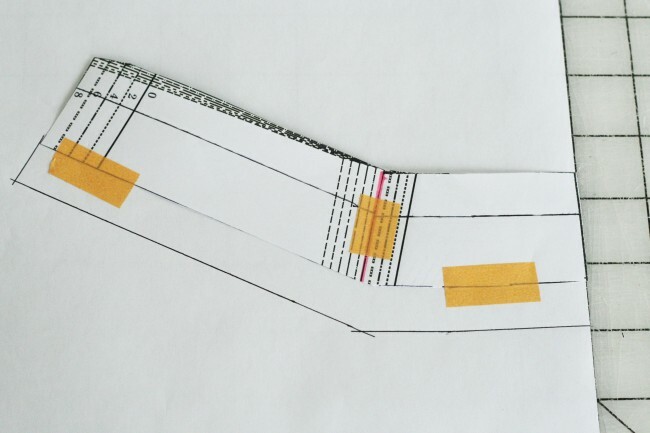 With a ruler, draw dart legs up to the edge of the paper. Set the pattern piece aside. Cut the waistband piece along one dart leg. 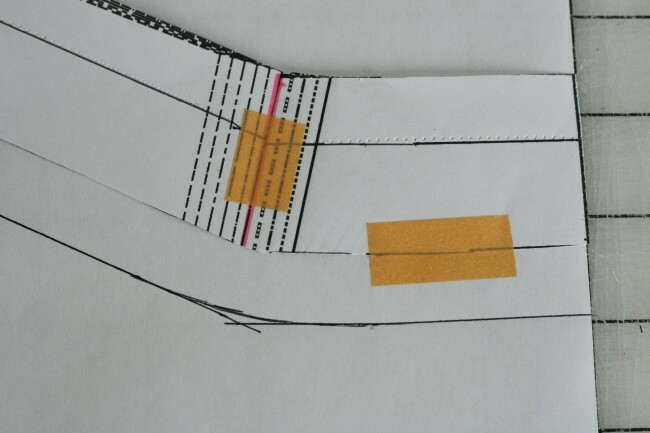 Close the dart by taping the two pieces together along the dart legs. 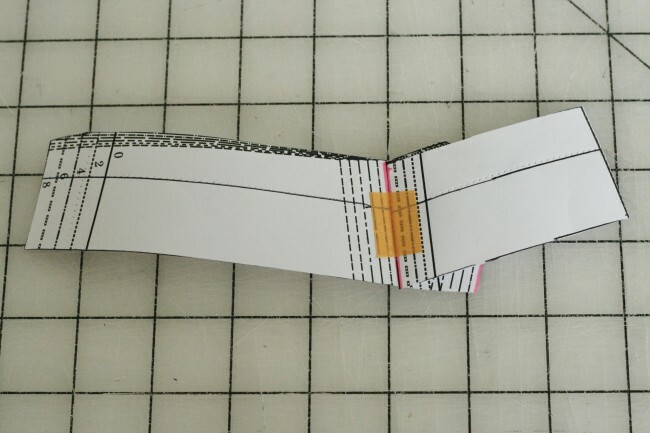 Tape the piece to some paper and add a 5/8″ seam allowance along the bottom line. Draw a gentle curve to smooth out any pointy areas. The back skirt pattern will have more of a curve than the front. This is because the back darts are wider than the front darts. Mark the pattern piece as shown above. 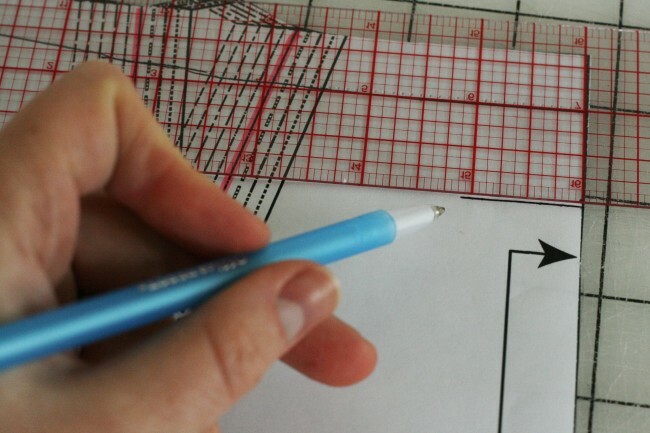 Repeat all steps for the second skirt pattern piece. Finished pattern pieces. 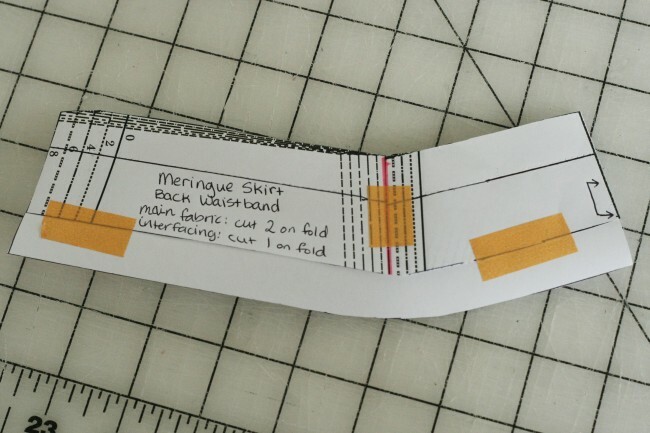 Now you’re ready to make a new waistband for your Meringue skirt! 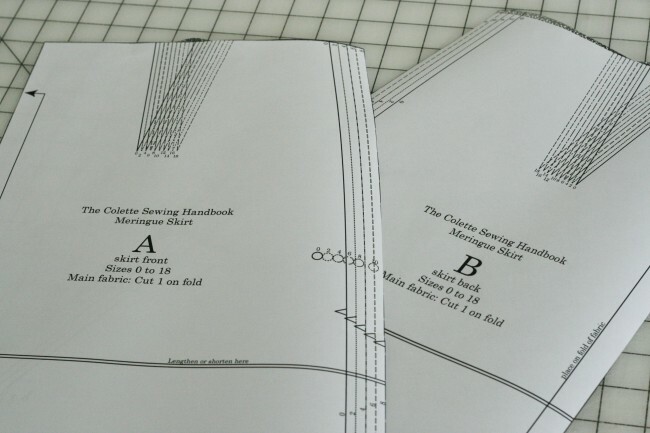 Tomorrow, we’ll show how to sew on the waistband. I just finished a beautiful red cotton poplin regular version of this skirt! I love it. The fit and feel is perfect! I can’t wait to make variations and might try the waistband next! 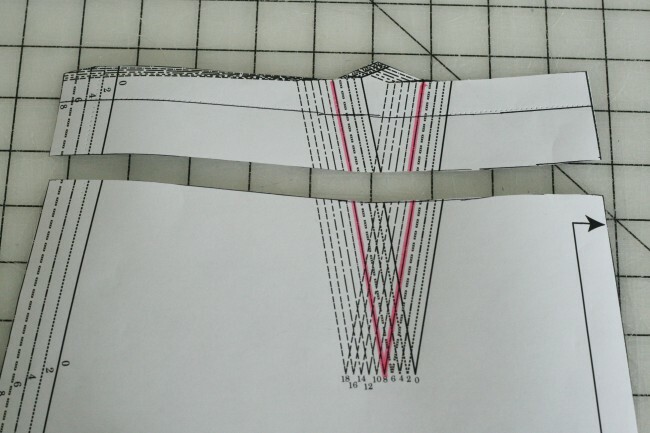 I also wondered if it is possible to do a bias tape finish on the top similiar to what you showed previously on the Clover pants? I wonder if anyone will notice if I make and wear a Meringue in every color of the rainbow! I just made my muslin for the Merinque and I was thinking I would like it better with a waist band- perfect!! Thanks! I actually chopped off the waistband of my Ginger (after all that work!) and did a twill tape “finish” inside as I am really high waisted- or is it short waisted? – anyway, don’t have much space between the breasts and the waist – and find a slightly lower waist suits me more. I wonder – if it isn’t for that reason, what difference does a waistband make? Is it a matter of looking more finished? Or because tops tend to stay tucked in better? Or what? I’m curious. Please enligthen. I think it’s a couple things. One is just aesthetic. Some people just really prefer the look of a waistband. I also find that waistbands tend to stay in place on your waist a little better. Not as much sliding around as a simple facing. I like both looks, personally. No waistband looks nice and sleek on me, which I like. Ah. Thanks for that, Sarai. It’s true they do slide around more…. Loving your book. I got some lovely fine green silk and am debating on whether to make another Jasmine – my striped green and pink silk one is great, but I haven’t figured out how to post pics here yet – or to make Taffy in it…. I posted a 5 star review on amazon and book depository. Hope your sales are sky high. It has given me quite a few aha moments :). I’m having trouble getting my zipper to line up on the meringue. The one side is higher. any tips? If I’m using a woven fabric would i could the waistband fabric and interfacing on the bias or the straight grain?